Eden Wealth was founded as CFS in 2004 by Pat Connellan and was rebranded in 2015 as Eden Wealth. Eden Wealth is an innovative Wealth Management firm that offers bespoke financial solutions to High Net Worth Private Clients, Corporate Clients and Group Pension Schemes. Pat started his career with Ulster Bank in 1995, quickly becoming the youngest person to be appointed to a managerial role within the bank’s Wealth Management division. He spent ten years working with the RBS Group before leaving to set up his own firm CFS, an innovative Wealth Management firm offering bespoke financial solutions to high net worth Private Clients, Corporate Clients and Group Pension Schemes. Eden Wealth offers a new specialisation in this target market, cementing Pat’s reputation as the Advisor of Choice to high net worth individuals. Pat has a Masters degree in Financial Services from UCD. He is also a qualified Pension Trustee Practitioner ( DC Pension Scheme Trusteeship). Pat holds the internationally recognised CFP designation as well as being a Qualified Financial Adviser and a Specialist Investment Adviser. Pat was also a keen sportsman in his youth having represented his County in Hurling and Football as well as lining out for Munster and Ireland on championship-winning youth rugby teams. Adele joined Eden Wealth in January 2017 having previous held roles with GE, Permanent TSB and nearly 9 years with Bank of Ireland Private Banking. Adele holds the LIB designation as a Licentiate member of the Institute of Banking. She is a Qualified Financial Adviser and has a Post Graduate Diploma in Financial Services from UCD’s School of Professional Finance the gateway qualification to the Internationally recognised CFP designation. Adele hopes to become a Certified Financial Planner after the next round of examinations in February 2018. Adele has a keen interest in dogs, walking and is a passionate supporter of Munster and Irish Rugby. 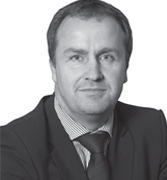 Paschal holds a First class honours degree in Business from LIT and is a Qualified Financial Adviser. He is currently in the process of completing his Graduate Diploma in Financial Planning from UCD’s School of Professional Finance with the final two modules to be completed in December 2017. Paschal would hope to receive the Internationally recognised CFP Certification after the next set of examinations in February 2018. Prior to joining Eden Wealth Paschal had 29 years experience in Industry before focusing on a career in the Investment Industry in 2010. Paschal is a keen golfer and follows all sports. Brian is a founding Director of Eden Wealth and has Project Managed most of the business strategies undertaken by the business since its foundation. Brian holds a Bachelor of Business degree from LIT as well as a Master Degree in Strategic Management and Planning from UCD’s prestigious Smurfit Business School. Brian has been actively involved in the Financial Services Industry since 1997 and continues to work as a consultant Project Manager on the future direction of Eden Wealth. Brian has a keen in Interest in the Arts, Current Affairs and all Sports.